Home > Party Voices > Help Puerto Rico rebuild! Washington, D.C. — In a tremendous show of unity, under a sea of Puerto Rican flags being waved high, thousands of Puerto Ricans and their supporters joined in the Unity March for Puerto Rico in the nation’s capital November 19 to demand justice for Puerto Rico. 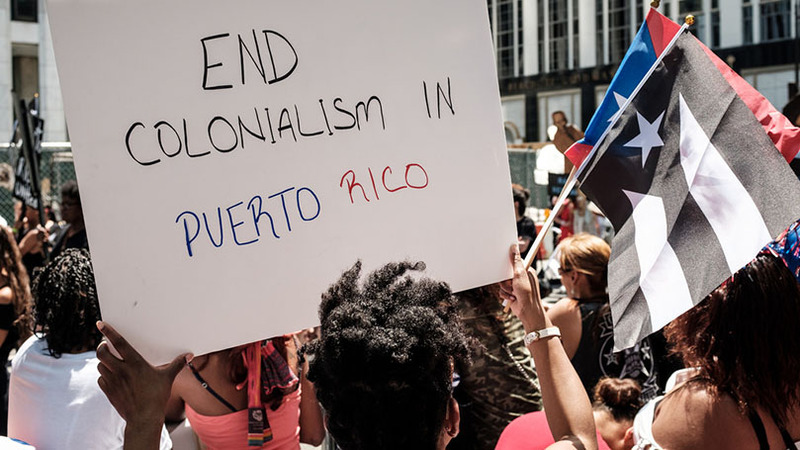 Demonstrators from across the northeast, Ohio, and as far as Chicago raised their voices in unison to demand the U.S. fully fund the relief efforts in the aftermath of Hurricane Maria, which tore through the island more than two months ago. Most of the island is still without basic needs, electricity, and potable water. Congressional leaders and legislators from across the country addressed the marchers and excoriated the Trump administration for the dismally inadequate response and relief effort that has resulted in the humanitarian crisis for the island’s 3.5 million citizens. The lack of food, medicine, and health care in the aftermath of the hurricane has led to the death of hundreds of people, they charged. “As U.S. citizens, Puerto Ricans have fought in every war in the last hundred years and sacrificed life and limb to protect freedoms we all enjoy and we come together and call on the United States to support Puerto Rico”, said one speaker. Darlene Elias, chair of the Green Party, called for an end to the colonial status of Puerto Rico and for “allowing Puerto Ricans to determine and exercise control over their own future.” A major aspect of such a process would have to be the dissolution of the financial control board set up by the Trump administration to deal with the island’s $73 billion public debt, largely through severe austerity measures against its people. Cancellation of the debt and repeal of the Jones Act, the law which prohibits foreign ships from entering Puerto Rico’s ports, were presented as integral measures for ending the colonial stranglehold of the U.S. over Puerto Rico. The call to be vigilant against profit-driven opportunists rang throughout the speeches. Recently, Secretary of Education Betsy Devos has been mobilizing to re-open Puerto Rico’s schools as private, for-profit charters, a move that would echo what was done to New Orleans after Katrina, and which the Teacher’s Union of Puerto Rico has vehemently opposed. Cameron Orr, marching with a contingent from the Communist Party USA, condemned the colonial stranglehold that the U.S. has had over the Puerto Rican economy and linked their struggles to those being waged here in the U.S. “The same policies of privatization and profiteering that hinder the recovery in Puerto Rico, are also threatening our health care, public schools, and quality of life in New York and other cities.” He pointed to the tragic consequences for the New Orleans school system after Katrina and the horrific results of privatizing the water supply management system in Detroit. Image: the Puerto Rican Day parade in New York City, courtesy of Flickr user ep_jhu.